12 Year Old Alex Miller Spots Major Firefox Security Bug and Gets the $3000 Bounty! Alex Miller is just 12 years old, but don't let his age fool you. He just made his mark in the technology world by spotting a major security bug in the world's second most popular web browser, Mozilla Firefox. And he might just be using Ubuntu at the age of 12! 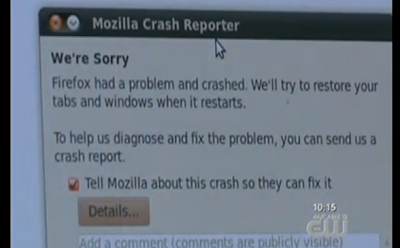 The window in the screenshot above appears while Alex Miller explains how he managed to exploit the Firefox security bug and made the browser to crash. And that's a Ubuntu desktop, no questions, "buttons on the left" has managed to give a unique identity for Ubuntu after all. And the kid might just be using Ubuntu as his default OS(though there is no way to confirm it). Another nail in the coffin of "Linux is not user friendly myth". Meanwhile, Alex also earned the "bug bounty", as Mozilla likes to call it, a full $3000 in cheque! CBS news calls him a "tech detective" and Mozilla's Brandon Sterne calls him a "genius" and "the youngest to find such a bug". Watch the video below, brought to you by CBS. Hope you enjoyed the video and the noticed the "Ubuntu" part too. Good luck Alex!